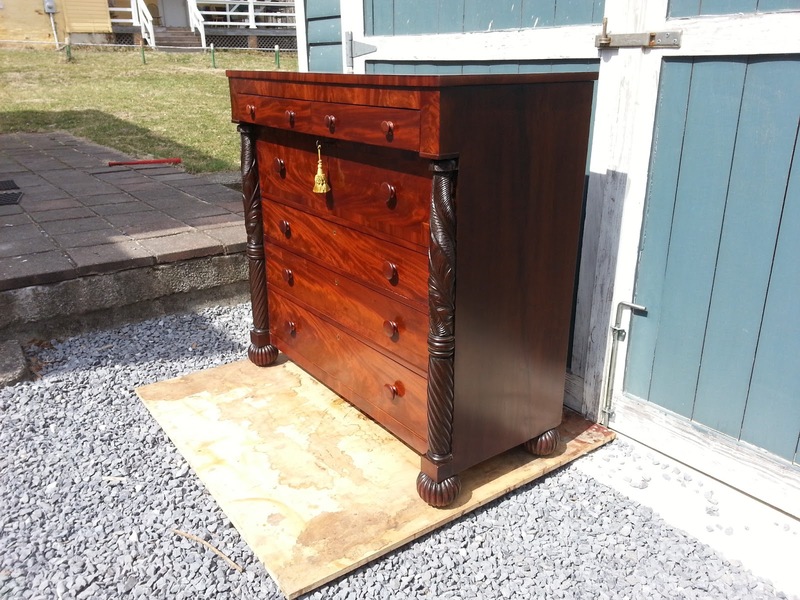 A recent restoration project was a chest of drawers from the Late Classical period of American Furniture. I say in the title that the piece was made of Mahogany, but in truth there were several other woods used both in primary and secondary settings. The entire front facade of the piece is made up of Mahogany and all of the other woods used in the manufacture of this piece play a supporting role. 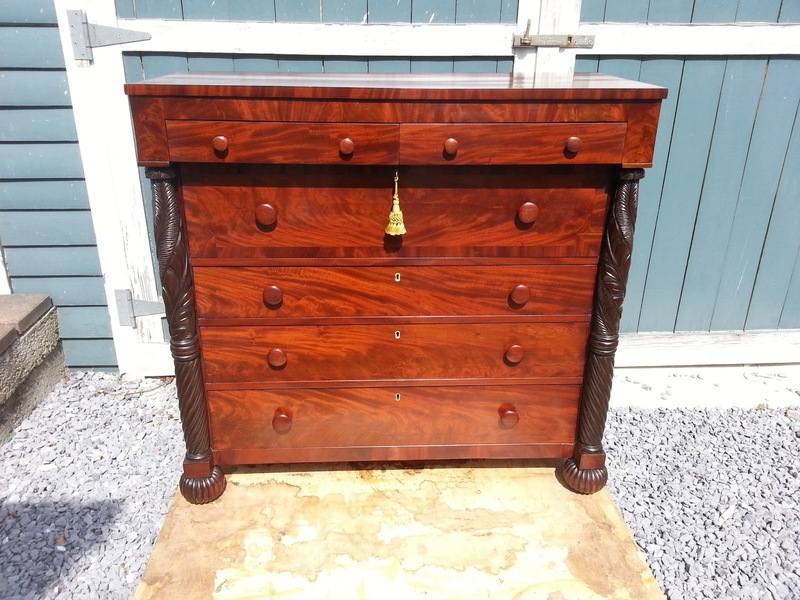 Before delving into the woods used, it would be useful to pin this chest to a specific time period to see how it plays a role in the evolution of style from Federal New York to American Empire and the larger Late Classical period. In researching a piece, I often ask the customer what they know about the piece. In this case the customers indicated that the piece was bought in New York some years ago. While pieces can move around a lot, I decided to look at other examples of chest of drawers from this period that are known to have been made in New York. Many pieces exhibited carved columns and similar drawer configurations. Upon further research, I looked at a book I have on Scottish cabinetmakers in Federal New York. The book is entitled "Scottish Cabinetmakers in Federal New York" and is written by Mary Ann Apicella. I referenced this book before in researching a Federal arm chair and have found it a good source of information on a variety of furniture forms. 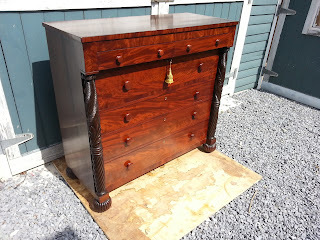 In her section on chest of drawers, Ms. Apicella takes a look at the styles of chests that emerged in early 19th century New York and cross references those styles with English and Scottish examples from the same period in an attempt to isolate the design elements that are unique to Scottish cabinet making. She speaks of the emergence of a wide frieze above the top set of drawers in English 19th century chests. This frieze was purely decorative and was typically veneered or sometimes fluted. Scottish examples have short glove drawers set into this frieze. According to Apicella, This is unique to Scottish chests. In this example, The top set of short drawers are entirely missing and the long deep drawer is on top. One point of interest is that the drawers below the top drawer are inset between the columns. The same is true of the example I worked on except all of the long drawers are inset between the columns and only the two short drawers are overhanging. It is my opinion that this chest has one foot in each period and in it is seen a transition in design from the late Federal to the late Classical or American Empire. 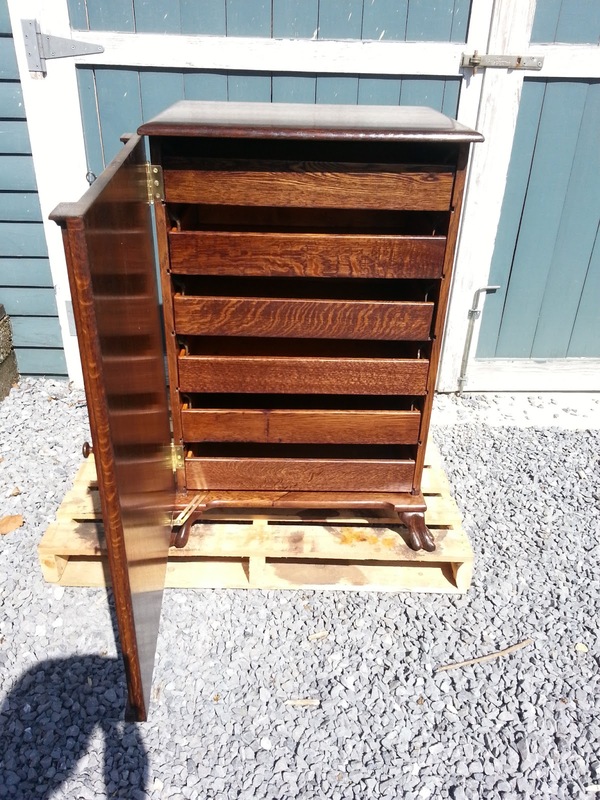 The other indicator of this is that the side construction on this chest is solid, where later examples (after 1840) show a frame and panel construction, as seen in the second link. This adoption of the frame and panel construction was to reduce the risk of the sides cracking, because the large panel is floating in the frame and is free to expand or contract. The solid side is fixed at its outer edges and as it expands and contracts the side cracks down the middle. 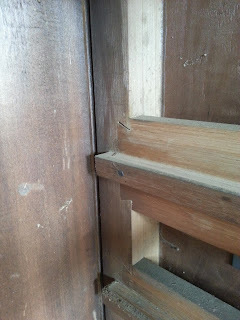 The chest in question suffered from this fate many years ago and Mahogany wedges were glued in place to fill the crack. Now that that is cleared up, onto the specifics! 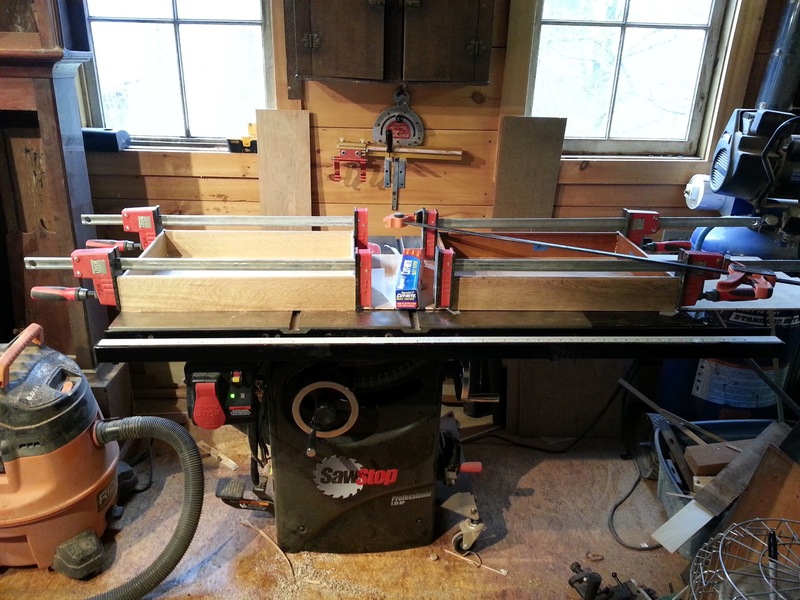 The chest was made primarily of Poplar and Cherry. 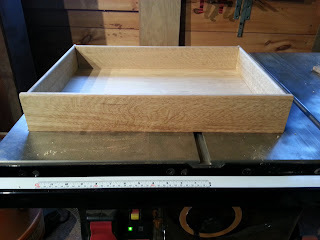 The poplar was used exclusively as a secondary wood in the case construction. 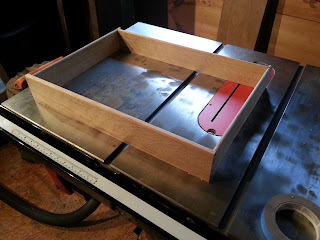 The Cherry was used for the top and sides and the upper edges of the drawer fronts. 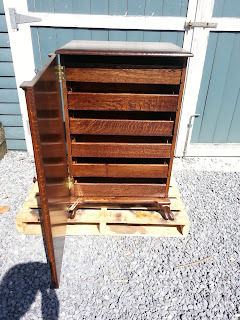 This is typical of pieces from this time as decent Mahogany was expensive and often hard to come by in wide widths. 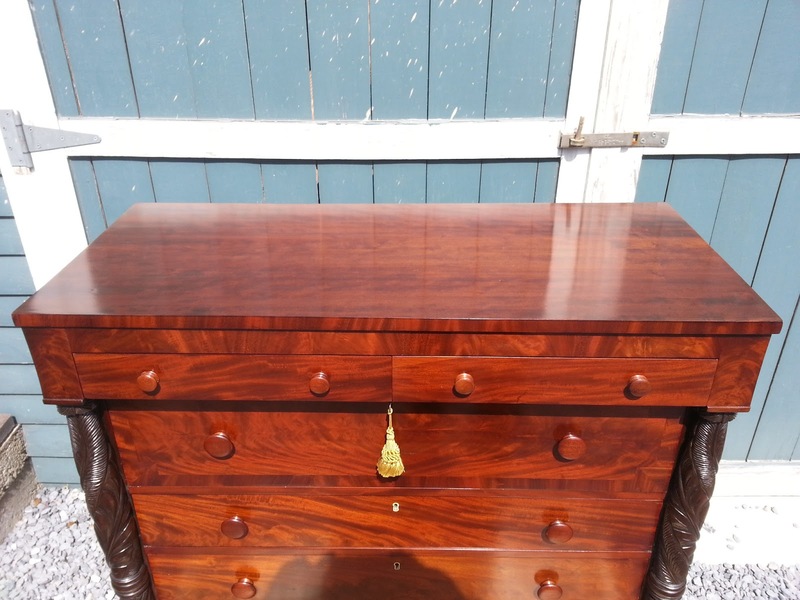 Cherry, sometimes called the "poor man's Mahogany" was often substituted and stained to match the Mahogany sections. 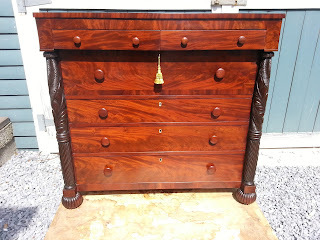 The front of the chest was veneered with a West Indies Mahogany, probably from Cuba or the Dominican Republic. 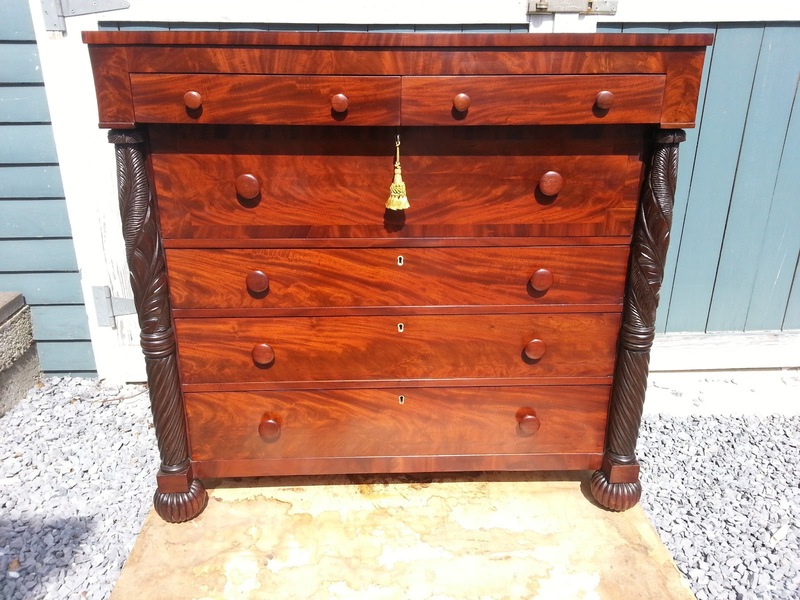 The columns and the knobs were made from Honduran Mahogany, which was typically used for these purposes due to its availability in wider widths. 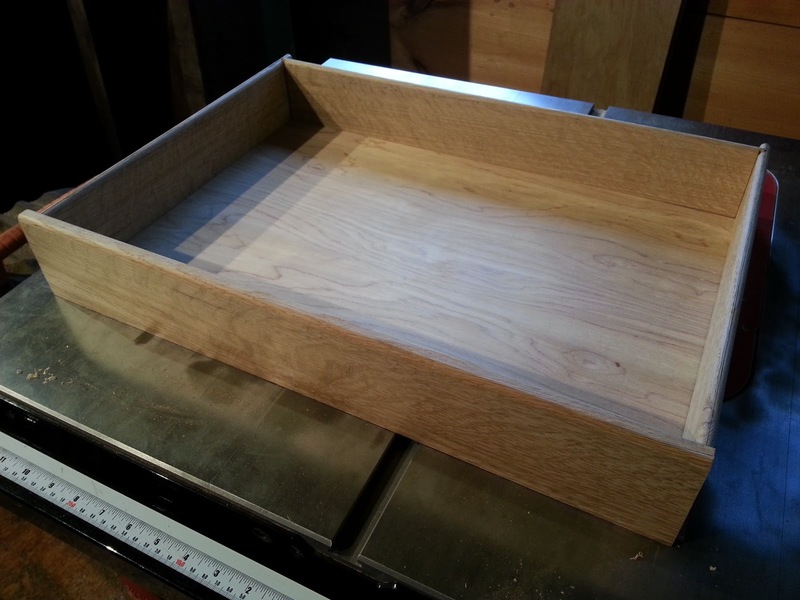 Other stray woods used in the piece were Pine in the case construction and Oak for the interior drawer slides. The columns and feet were both highly carved, the columns with Acanthus Leaf and spiral reeding and the bun feet were also reeded. The inclusion of these well carved elements points towards a city center, such as New York City, as a place of manufacture, but it is difficult to say. Perhaps this was made by a Scottish Cabinetmaker in New york later in his career. 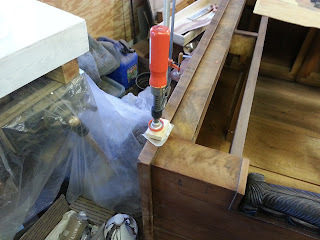 One other element that would pont towards a Scottish or English hand were the atypical small pins in the dove tail construction on the drawers. American Dovetail pins are usually wider than their British counterparts. The inclusion of these small pins in an American chest may point towards an immigrant cabinetmaker. There are many clues, but just as many questions! 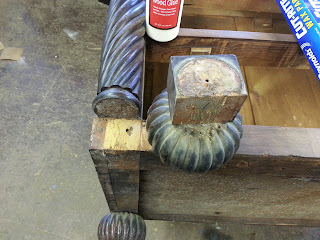 The condition of the chest was pretty good when it came to me, but the majority of the finish had been ruined with repeated application of Linseed oil. This caused the finish to crack and soften. The exception to this was the carved elements, which were in much better shape. Because of this I decided to remove the finish from the top, sides, and drawer fronts and leave the carved elements with the existing finish. This allowed me to also remove some black rings on the top of the chest and repair loose and missing veneer. Below are some photos of the restoration process. These first few photos show some repairs. 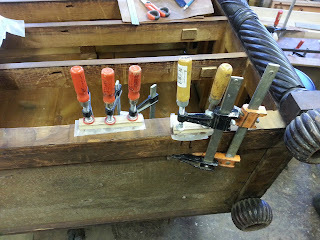 The first photo shows veneer being glued down and patched. 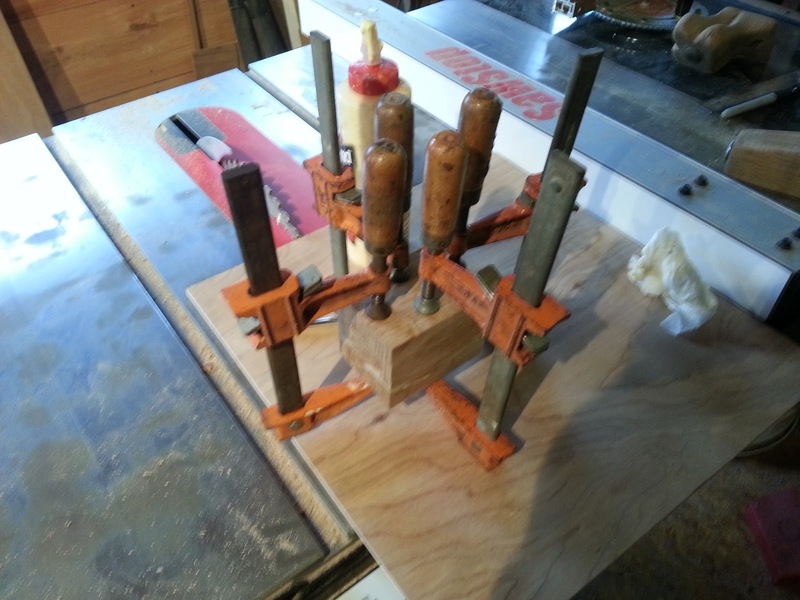 The following photo shows one of the feet removed which was later glued back in place. The third photo shows more veneer repair. 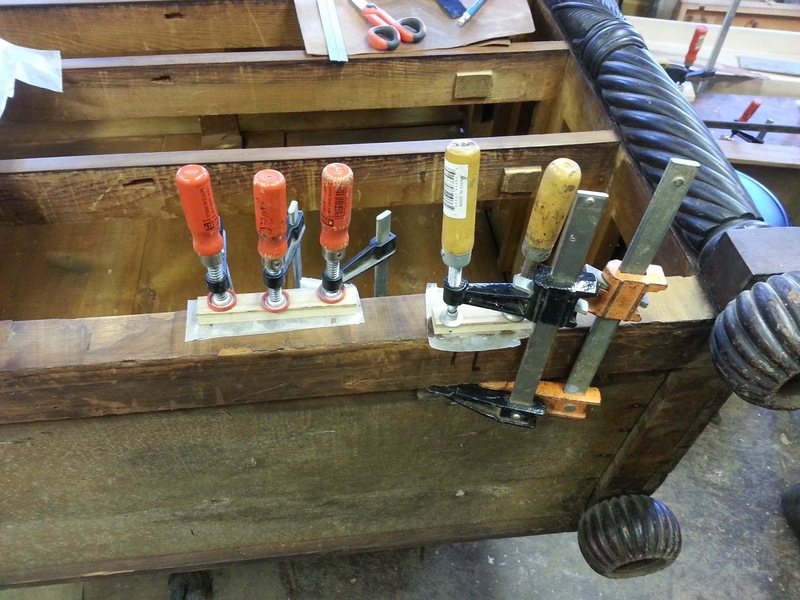 This photo shows veneer repair done to the large crosbanded drawer as well as a repair to one of the short drawers. 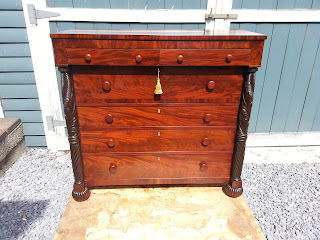 This photo shows the chest repaired and with all of the repairs in place. 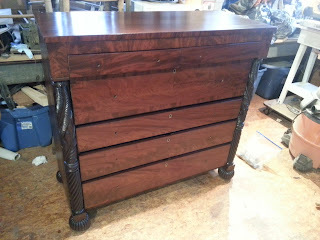 You can see that I manitained the existing finish on the carved portions of the chest. These next two photos show the side construction from the inside of the chest. There were metal brackets which spanned the cracks in the sides. These were put in during a previous restoration in an attempt to stabilize the cracking sides. I figured that they did more good than harm, so I decided to leave them. 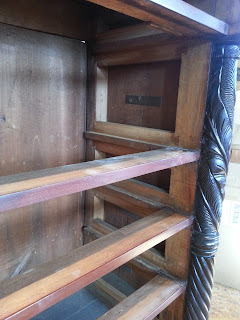 The second photo shows how the drawer supports were dovetailed into vertical stiles which supported the carvings in the front and acted as legs in the back of the chest. 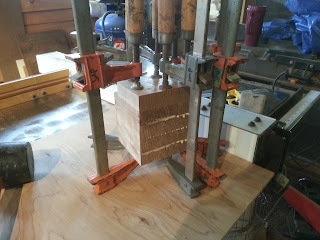 The next two photos show the chest during the finishing process. These last few photos show the completed chest of drawers. In keeping with the theme of my last post, I thought it would be appropriate to unveil my new saw, purchased just at the end of 2012. 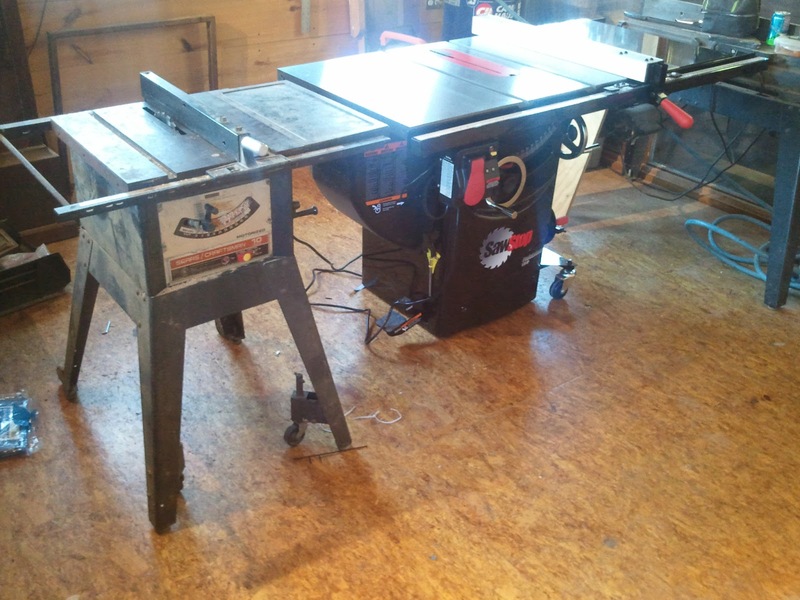 It is a SawStop professional cabinet saw. 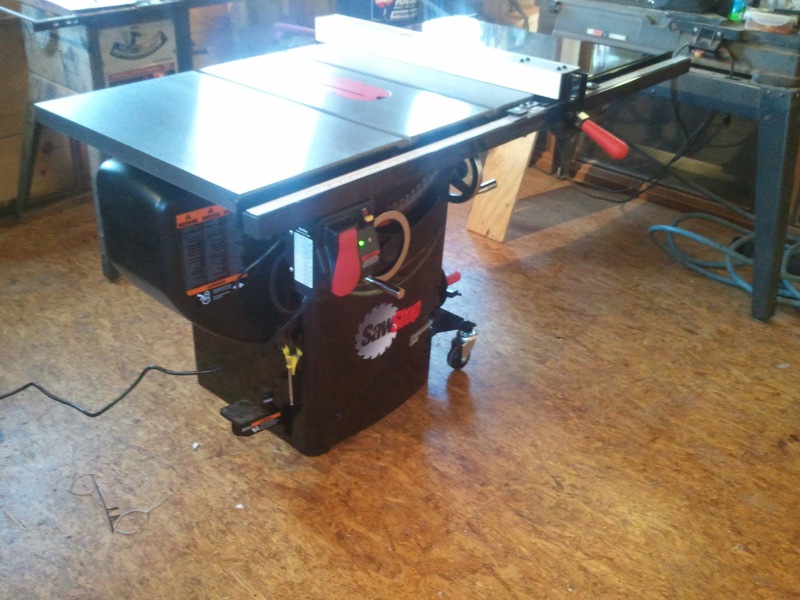 This saw works beautifully and is very accurate, and it can handle large sheet goods and fine adjustments. 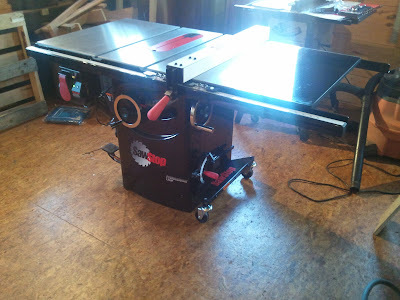 I have been looking at purchasing a nice saw for a couple of years and my wife and friends convinced me to pay over twice the price of the saw I was looking at and buy a SawStop. Anyhow, thanks for all of your concern about my gouge accident! Here are a few photo of the sparkling new saw! The saw on the left is my old Craftsman saw ca. 1970. 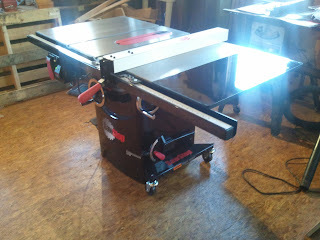 A real trooper, but hard to adjust and very small next to the new saw. I have finally retired it after 10 years of service! Recently I worked on a piece that is a bit of a mystery. It is an Oak cabinet that was made sometime in the early part of the 20th century. 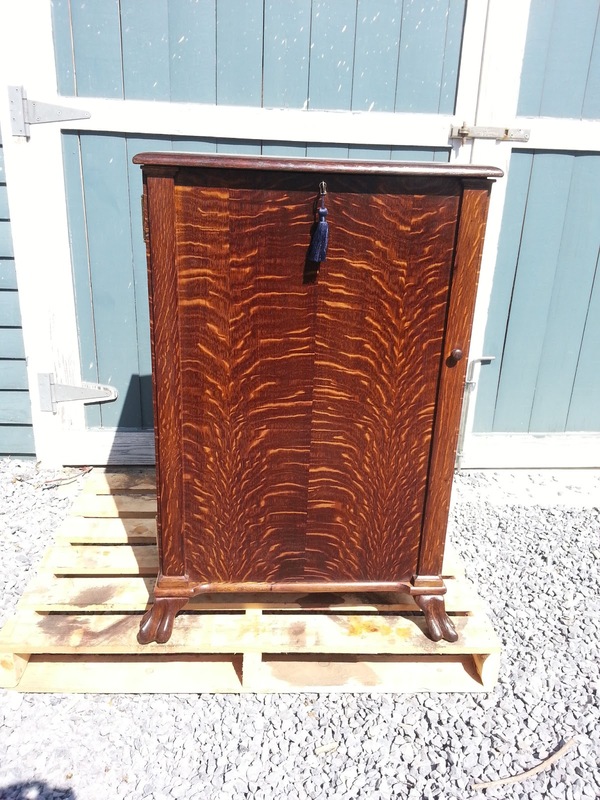 The cabinet has a large door that opens to reveal six drawers. The drawers all had bottoms that had holes drilled in them every three or four inches in a grid pattern. There is also a shadow of some pieces that cris-cross the holes in a x-pattern. 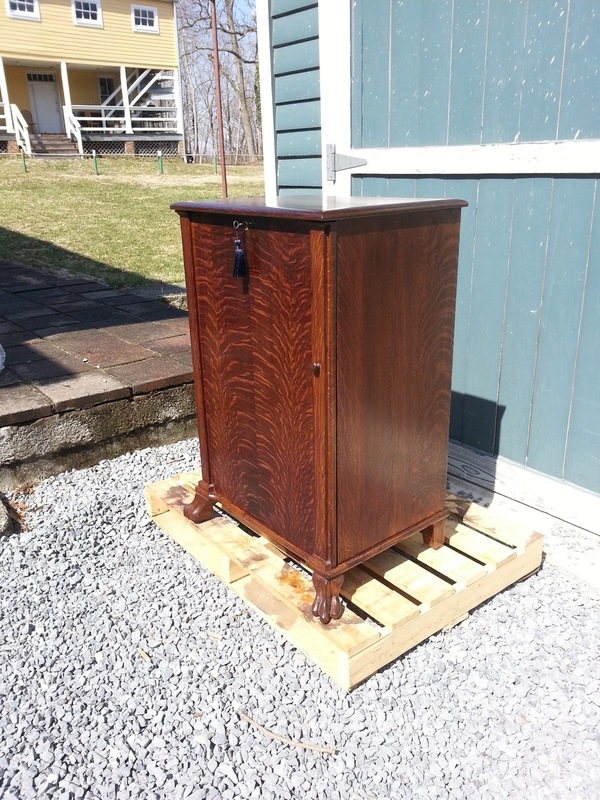 The owner of the cabinet thought it might have something to do with an old record player, like a Victrola. The thing that first came to my mind when I saw it was that the holes had dowels in them at one time and that these dowels received bobbins of thread that were not in use. If this were true than the bobbins would have to have been pretty large in diameter and height and also the cabinet would have had the capacity to store many bobbins. If it was used for this purpose, it was likely used in a commercial setting. 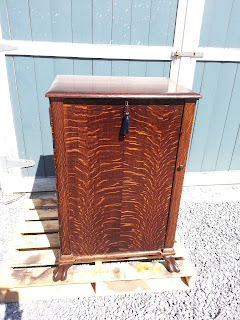 All of that being said, I really have no idea what this cabinet was initially used for. The cabinet was made from Oak and portions of the case were veneered with book matched panels of Quarter Sawn Oak with a very pronounced grain pattern. If it was used in a commercial setting, I wonder why the manufacturer made it look so good? The cabinet was in pretty rough shape when I received it. The finish was cracked and the top was marred with scratches and rings. In addition, the cabinet was missing a portion of the bottom of the case as well as two feet (one a carved lions foot) and it was also missing a drawer. 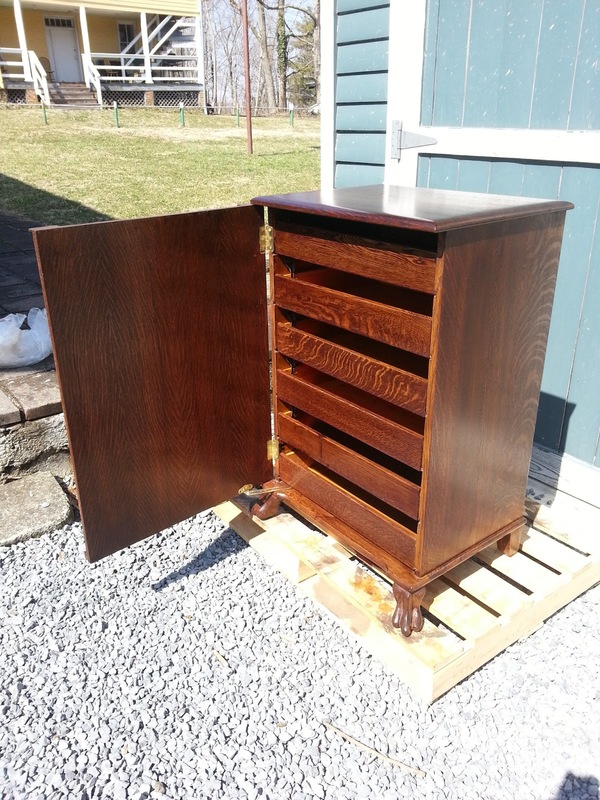 Below are some photos of the restoration of this mysterious Oak cabinet. The first thing I did was to remove the finish from the cabinet. 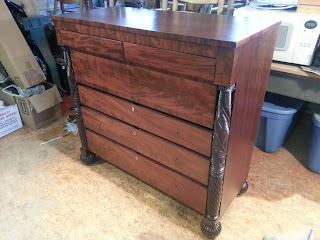 Once that was done I set about the repairs and also making the drawer and the missing feet. To make the drawer, I disassembled an original drawer so that I could make copies of each individual component. 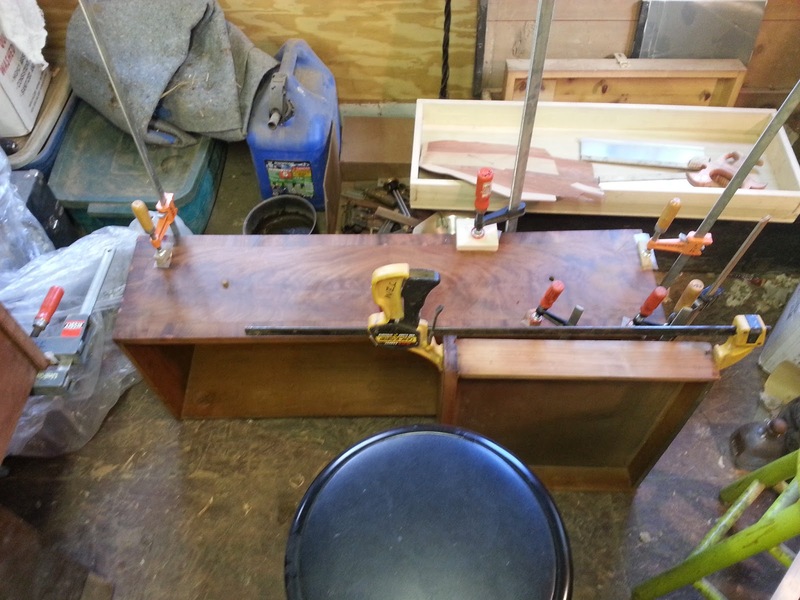 The photo below shows the drawer disassembled. The blue tape shows me the orientation of each board for reassembly. The front edges of the two side boards were dovetailed into the front of the drawer using a half blind dovetail. This means that the ends of the dovetails on the sides are concealed by the front of the drawer. 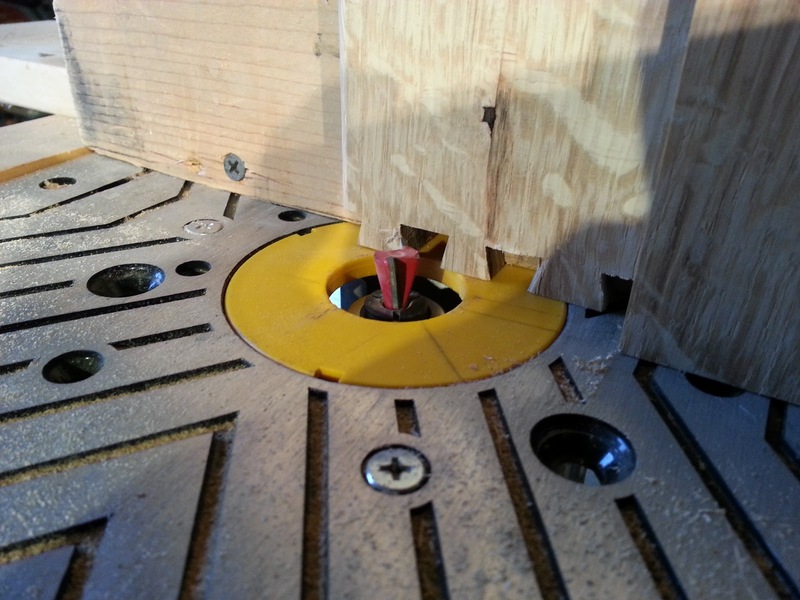 These original dovetails wer produced by machine and so I faithfully reproduced the originals using my router. 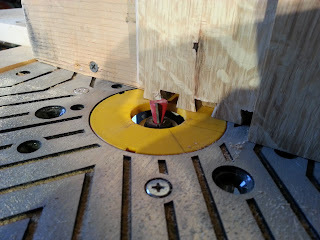 To do this I built a cross cut sled for my router that allowed me to move the edge of a board across a moving bit. 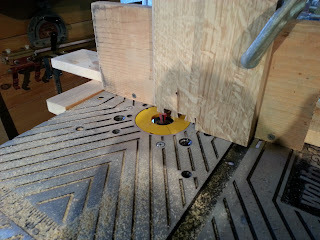 I then set up the router in the table with a dovetail bit and cut my dovetails. Below is a close up of this operation folllowed by a shot taken from further back. I used a similar procedure to cut the mortices for the dovetail pins into the board that would be the front of the drawer. 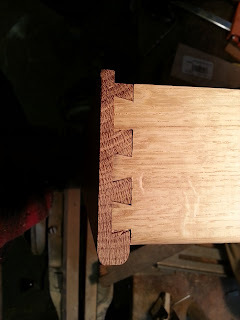 Here is a close up of the completed dovetail on one side of the drawer. 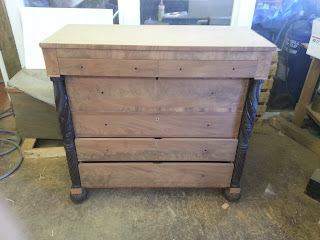 This photo shows the new drawer constructed minus the bottom. 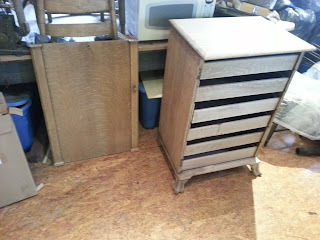 This photo ( a little out of sequence) shows the new drawer sides beside one of the sides I had copied. The next two photos show the completed drawer with the bottom. 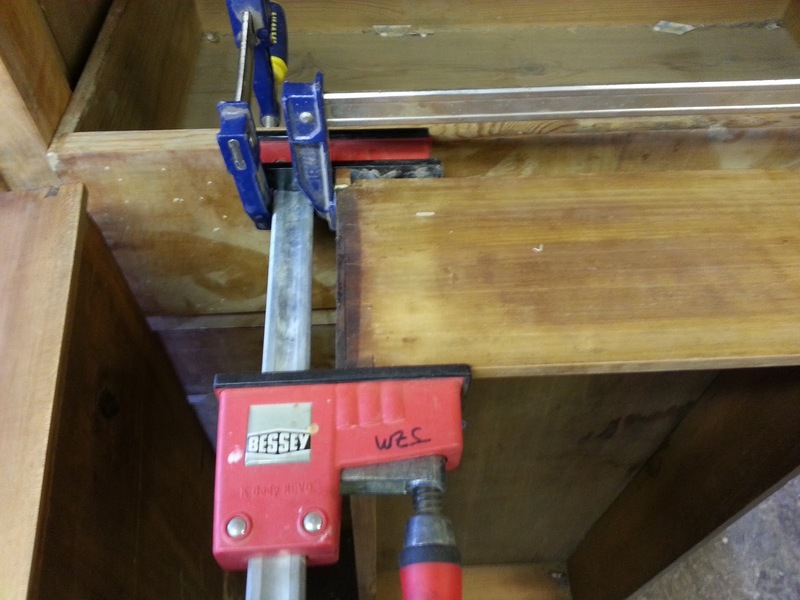 The bottoms of the original drawers were plywood that was nailed onto the bottoms of boards. I kept with this design when I made my drawer. 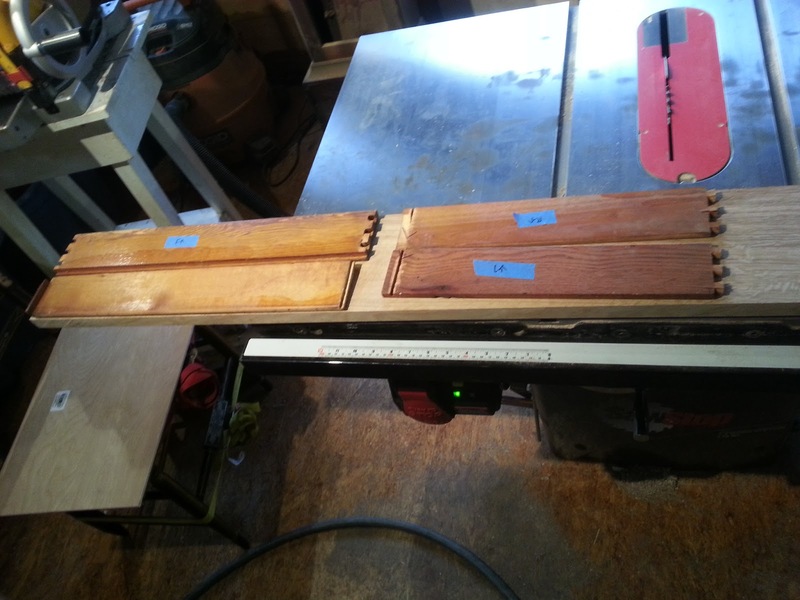 This last photo shows the new drawer on the left being glued next to the one I disassembled. I glued them on the table saw to ensure that they were flat. 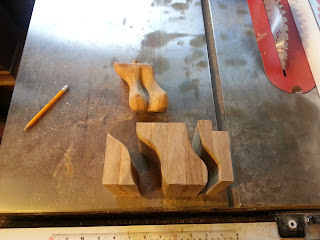 To make the missing feet, I first had to glue up some Oak to create a block large enough to accommodate the size of the feet. 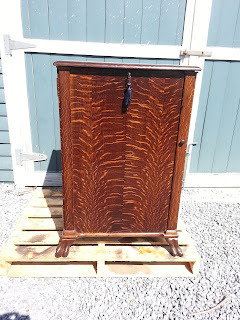 Once again, this was done on the original cabinet instead of using a thick stock of Oak. 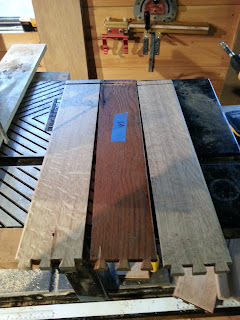 The next two photos show the blocks being glued up. To create the carved foot, I traced the profile of the original (seen above in the photo below) and cut two sides of the block. The block is seen after the cuts were made in the photo below. Using double sided tape, I then reassembled the block and cut the adjacent sides. After those cuts were made. I removed the unwanted sections, as well as the tape. The photo below shows the double sided tape on the piece to the right. 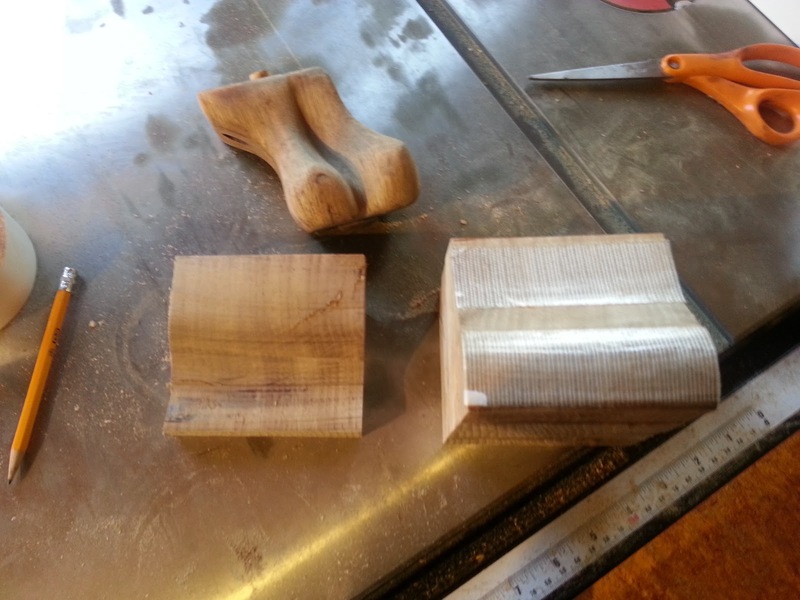 The photo below shows the sawn block roughed out to the shape of the original foot. 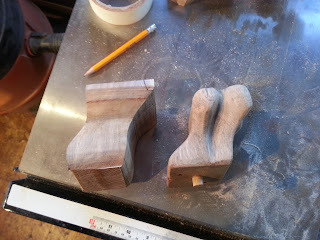 I then carved the detail of the toes by hand. One quick side note: When carving with an extremely sharp gouge on tough White Oak, try not to point the gouge towards your hand. I slipped and it went straight into the inside of my knuckle! That meant a trip to the ER and two stitches. Oh well, It happens to the best of us, but I am happy to say that the finger has healed and I am currently typing with it!! Jumping ahead in time, This photo shows the assembled cabinet with all of the feet and the new drawer in place, ready to be stained. 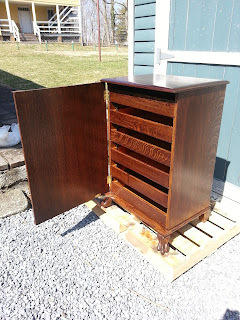 The last few photos show the completed cabinet. The new drawer is on the bottom in these photos. 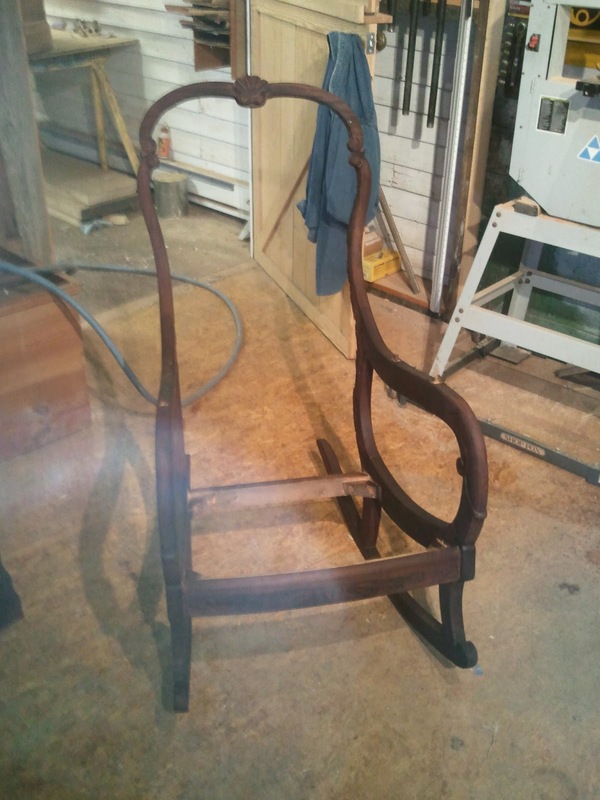 A recent restoration project involved a Late Classical Mahogany rocker made around 1830. 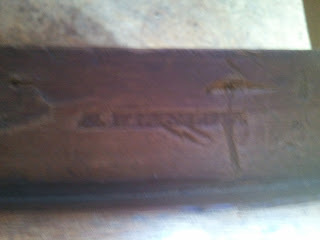 The rocker was stamped with the name "S. Winslow" on the inside of the front seat stretcher. 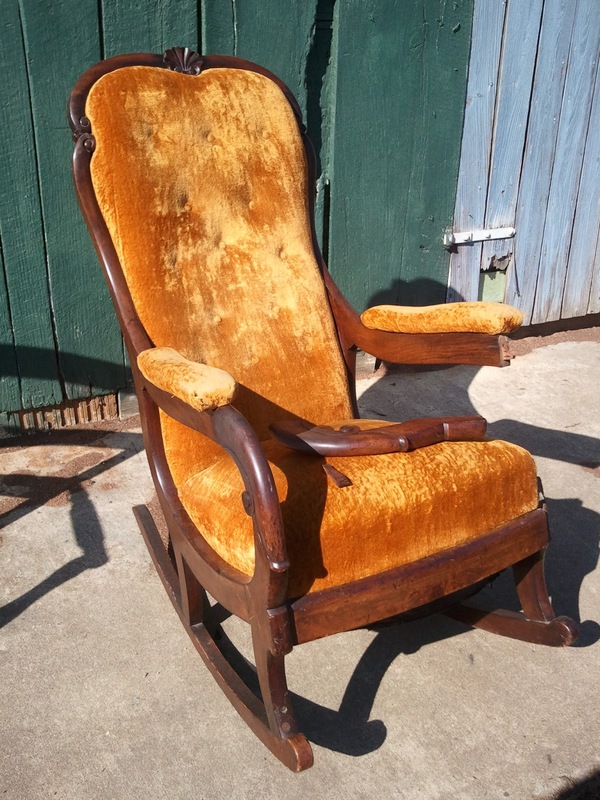 Unfortunately, no other reference to this chairmaker could be found, but most likely, he was working in one of the cultural centers of the eastern seaboard during the early 19th century and produced this rocking chair. 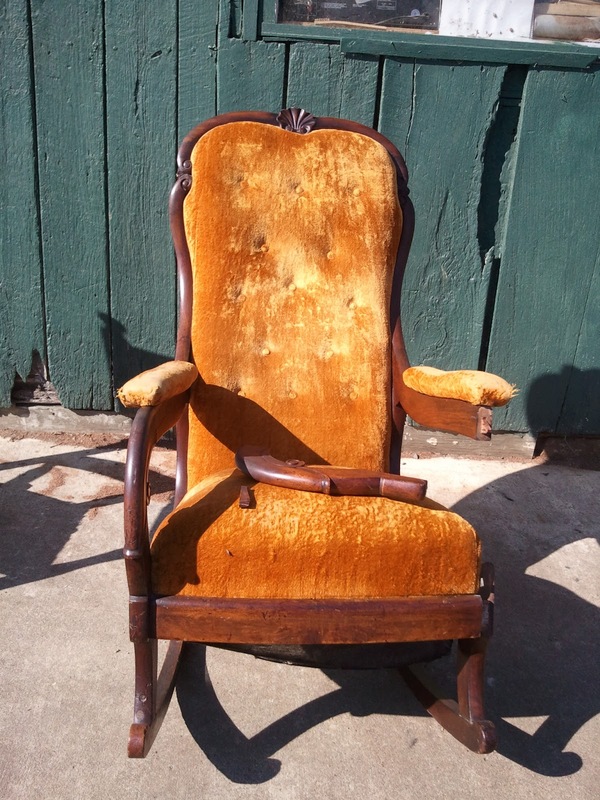 Judging by the detail and the mahogany used, I would think that this chair was made in an urban area, and not in the country. Also, the fact that the cabinet maker had a stamp (or signed his work at all) indicated that it came from a shop that was producing a good amount of furniture. The rocker had several structural problems when it came to me. 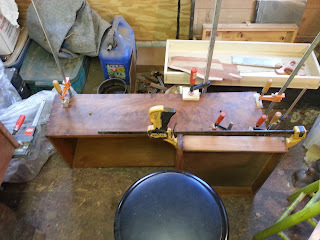 The right arm post (facing the chair) had fallen off and the joinery was generally loose. The finish was also in rough shape and after some consideration, I decided to remove it. 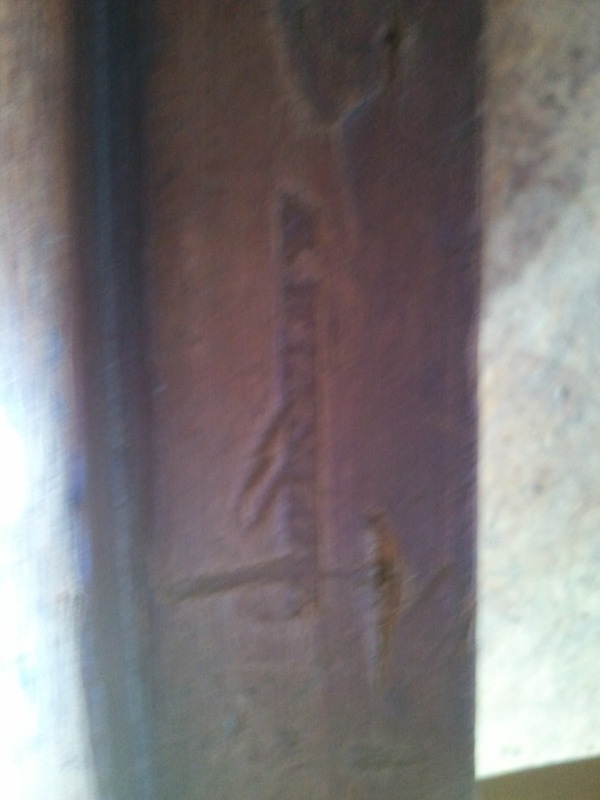 Below are two photos of the rocker as it came to me. 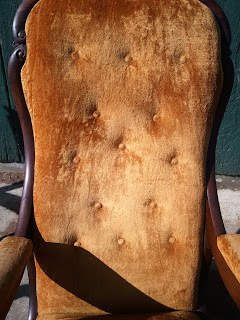 The buttons were pulled on the back of the rocker, but they were very uneven. 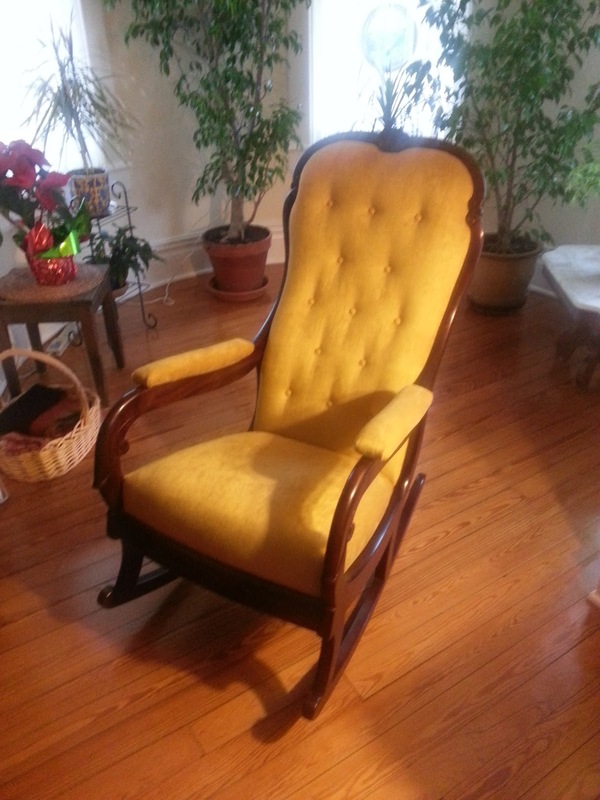 Generally, this fabric was worn and not original, so the customer and I decided to have it reupholstered as well. The button layout can be seen below. Here is photo of the stamp reading "S. Winslow". Once the finish was removed from the chair, I set about the repairs. One quick note, the way this chair was designed, the upholstery was attached to a seat frame and a back frame that once upholstered, would fit into the frame of the chair and be screwed in place. The only fabric that was attached to the chair itself is a piece of fabric on the back side of the back. This covers the work on the back side of the back frame. 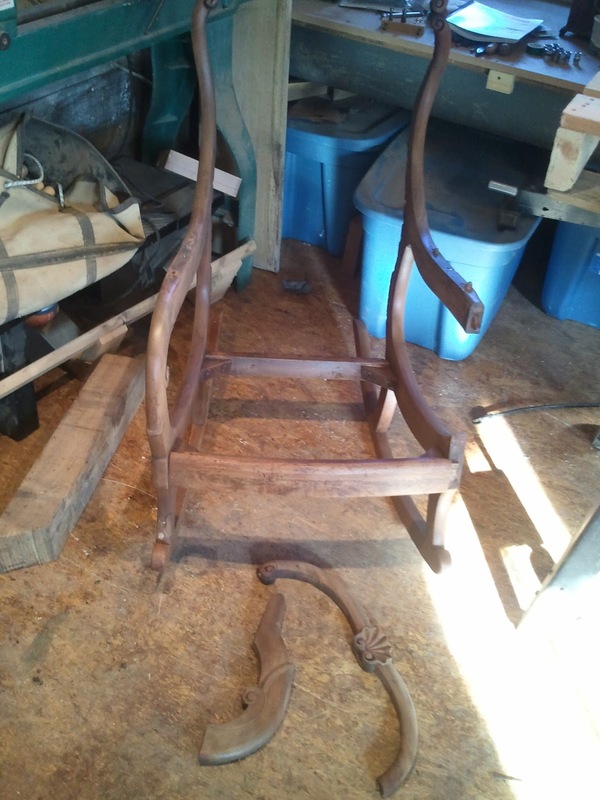 Once these frames were removed, all that was left was the chair frame. In disassembling the chair, the crest rail fell off as well. This had been repaired previously several times and need to be glued in place. Below is a photo of the chair frame with the crest rail and arm removed for re-gluing. 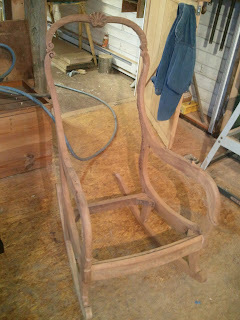 This next photo shows the chair frame assembled and sanded, ready to be stained and finished. The following photo shows the chair after it was stained. 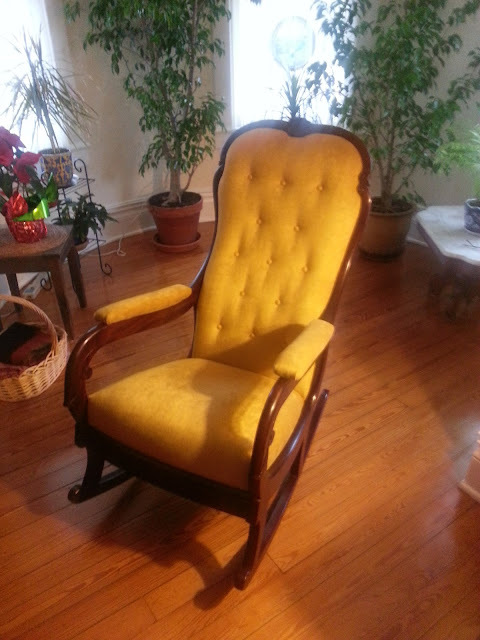 This last photo shows the completed chair with the new upholstery. The buttons were pulled on the back but this time they were placed a little more evenly!